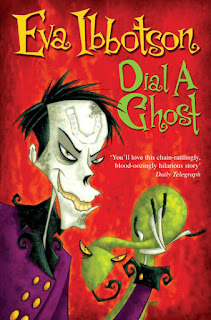 Z and I did read one book together for RIP this year -- Dial-a-Ghost by Eva Ibbotson. This book was similar in theme to The Great Ghost Rescue which we read last year but it was different enough that we had fun anyway! The book is about this boy called Oliver Smith who goes to Helton Hall but gets bullied by Fulton & Frieda Snodde-Brittle. Fulton asks Dial-a-Ghost Agency for scary ghosts for scaring Oliver to death but the Wilkinsons showed up instead. The Wilkinsons are friendly ghosts who wanna protect Oliver. The Shriekers were the original choice to go to Helton. The Shriekers were scarier! I thought the book was funny but scary at the middle. My favorite character was the pet budgie because he was kinda stupid. The book made me believe in ghosts! Loving that cover! And Z has quite a talent as a book reviewer! Sadly it's a UK cover. Ours was much more boring. I wish we had this one!